Dave lived out of a bag for 10 years just to keep costs down as he tried to make a living from the thing he loved most in the world, adventure. After a while though he started to think about settling down, but by then a house seemed a bit boring and expensive. So why not live in a unique tiny house? A shipping container? A boat? Or a bus? In between wondering what weird things he could live in Dave realised he didn't know many of the people who followed him on Facebook, so he decided he could put one night aside and invite his online 'friends' camping just to see if they were real people. 19 people turned up under the clock at Liverpool St Station that evening and they caught a train, found a hill and slept under the stars. What's more, they all seemed nice, so Dave did it again the next week, and the next, and...well, here's the full story. And that was the moment when Chris got himself into something unusual! Stop. You're getting distracted! But you do have a point - campfires ARE cool! Every evening on the Mississippi Chris took it upon himself to bound around and gather firewood and industriously stoke the flames. He wasn't just a good guy, but he wasn't afraid of getting his hands dirty. In fact, Chris was an engineer, exactly the type of character that gets things done. And Dave, for all his ideas and silly projects and long distance journeys, was absolutely crap with his hands. As the YesTribe grew Dave saw new potential in ideas he had once had, and converting a bus into a home started to play a back seat to the idea that a double decker bus could actually make a super cool countryside hub for the YesTribe. A place that would be utterly unique in a very familiar frame. One that would entice people away from the city into the countryside. A relaxing, safe space that would be the perfect setting for an escape, a new start, the incubation of fresh inspiration. From co-working desks to a base for school kids to explore the countryside and a new way of thinking. A digital detox retreat designed to improve the mental health of adults struggling with the pressures of modern society. A centre for skill-sharing. An events space with drop-down cinema screen and a memorable site for team building days. An example of exactly what is possible when you take an idea and just act on it. The SayYesMore team started looking around for land where a bus could live and one day Chris and Dave looked around Home Farm in North London. After that visit they had breakfast in a cafe, realising that convincing someone to give them land for a bus that didn't yet exist was actually quite hard. And right there, over toast and sausages, they decided to get started and buy the bus first, worry about land later. There's a business in Essex called Ensign and they take in former London buses and either sell them on or use them as a fleet of rail-replacement vehicles. We asked around and Ensign were recommended, so Dave, Chris and their friends Tam and Rima, camped overnight in fairly wet conditions and then walked three miles to the bus depot. They looked at two buses that day. Both were roughly the same age (built in the early 2000's), both were double deckers and exactly the same shape and size. But there were standout difference. One of the buses was red, and the other had spent its last three years on the Isle of Wight and had a very cool orangey wraparound design covered in dinosaurs. On the back there was even a Transformers poster. It felt....right. Walking around the bus yard had brought the (potentially stupid) reality of the situation home. Buying a bus was relatively simple, but it was a huge thing, a crazy commitment. Who does that? But one thought was nagging - what if someone bought the dinosaur bus by the time they made up our minds? 9. We bought a bus! The next week Chris and Dave returned to Ensign and signed a piece of paper. That same day the bus passed its MOT, Dave and Chris got to go UNDER the bus (safely) and then all the seats were ripped out. Just like that, they were the proud owners of a double decker without any seats in it. The next week the bus was delivered to its new home, a boat yard in Shepperton where the conversion would take place. A few members of the YesTribe came over for a celebratory campout - there was cake and illuminated balloons and hammocks - and then the work started in earnest. The bus was filthy and the tribe helped clean it up at the same time as Chris started stripping the innards down to a place where he could start building up from. The upstairs floor disappeared. The expansive plastic wheel covers were removed. All necessary wiring was cut out and plonked outside. It was happening. Now there was a bus the hunt for land begun again and a message on Facebook gave cause for optimism. Nikki Gilbey worked at Brinsbury Agricultural college in Sussex and she expressed an interest in forming a partnership with SayYesMore. Dave visited first and was struck by Brinsbury's likeness to the vision he'd had for a countryside bus base. The next week Chris, Tam and Jules joined Dave for another visit to Brinsbury and they camped in Keeper's Field, a triangular and deliciously green section of the campus that had no current use. This, Nikki told them, could be a home for the YesBus. It was perfect. For the rest of 2016 Chris continued to work on the bus. He got friends in to help with some jobs but mostly it was just him, working in evenings and on weekends and then, once jottings of the bus became commonplace at work, he took a three month unpaid sabbatical to speed up the progress. The inward-opening rear doors came off and the hinges were rebuilt so they would open outwards. A U-shaped seating area began to develop over the rear wheel-well. Chris built a frame for the new upstairs floor and laid a new, flat surface. He installed a sunroof and vents throughout, hoping that they would in some way alleviate the heat that naturally built up in what was effectively a tin can on wheels. As 2016 turned into 2017 Chris continued working on the bus and as Spring arrived the exciting stuff began to happen. Insulation was covered with cladding. A wood burning stove with two-storey flue became a familiar fixture in the middle of the bus. The upstairs ceiling went on. Seating was completed. 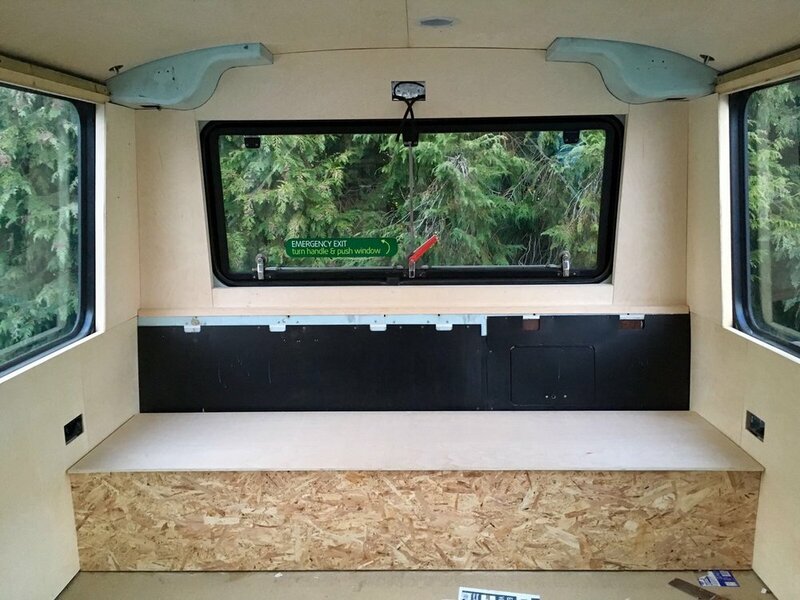 Power sockets installed and a thousand other small tasks which only Chris will ever know about, but were integral to the successful future of the YesBus. In the Summer of 2017 the conversion was nearing completion and a crowdfunding campaign began. From one or two people with a new idea this had become a project that hundreds were contributing to, turning the bus into something that will benefit hundreds and thousands. So many people play a part in a project like this. Two days before Yestival, in October 2017, the bus got dressed up in new clothes, drove about a hundred miles and crawled up a country track before performing a tight manoeuvre into its new home. Dave cried. Everyone else cheered. And just like that, there was a bus in the countryside. 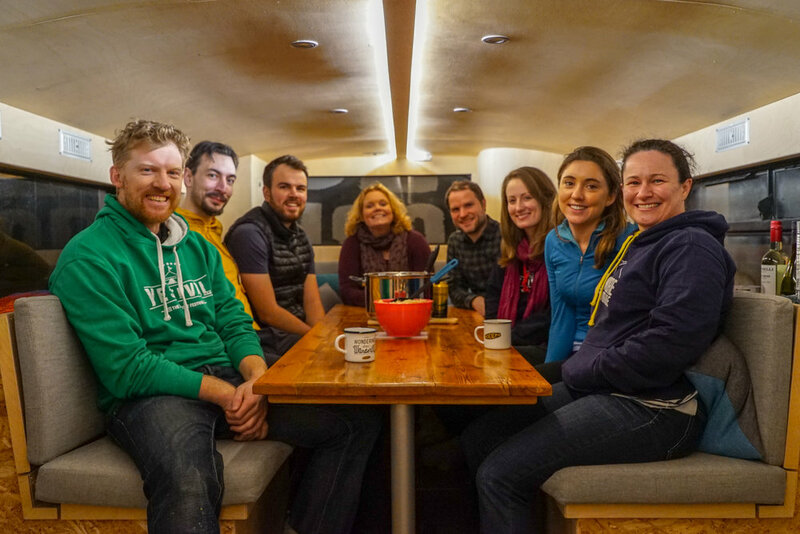 Yestival was a chance to introduce people to the bus, hold a couple of talks and start to work out just how we manage groups on board. Storm Brian's rain and 50mph winds meant a no-shoe policy was introduced from the off, and it was simply awesome to see people's faces when they saw Bussy for the first time. Post Yestival was a chance for a sort and clean-up ahead of a long winter. A squirrel had buried its nuts underneath the staff Yurt at Yestival, so Bussy made friends with those nuts for a while. The SayYesMore shipping container was emptied and re-arranged multiple times, and plans were made for the coming months: a lot still had to be done before Bussy's official opening in the Spring. As the years turned it was time to focus on the next big jobs. Our good friend Jon Bassett is a dab hand at installing solar systems and luckily we were sponsored the panels by a lovely chap named Peter at Lovat Energy Systems. Before we knew it Bussy had a power source topped up each day by our friendly yellow orb high up in the sky. Our first event of the year was a gathering of the Adventure Book Club. Evening meal, campfire and a film kept everyone happy, and then we all camped out, appropriately, next to the adventure book library on the upper floor. One thing keeps us all going at SayYesMore. Coffee. Problem is, washing up mugs without running water was always quite time consuming so this was a big step. Chris had taught himself enough plumbing skills to connect up the system and by the end of January we had running water. What a victory! We loved the natural setting that the bus had found itself in but consistent bad weather would be difficult to work with. Hundreds of feet would tread this ground in the months and years to come so a firmer surface was needed. We were introduced to an awesome guy named Alan and in two days he transformed the site, pulling up tonnes of surface clay and replacing it with all kinds of hardened material, crushed concrete and stone. Before we knew it the outline of the new YesBus site had been scraped out, filled in and prepared for the next stage, planting! One day in April Dave and Chris shovelled tonnes of brand new soil all over the site, to cover up excess clay and lay down a surface for the lawns which they hoped, in a few weeks time, would be home to picnics, chattering groups of people and of course, a luscious bed of grass. Grass seeds were strewn, watering cans filled up (thanks to an abrupt change between winter and summer which went from freezing temperatures to baking sun without any normal stuff in between) and slowly, the brown soil gave birth to new green grass. It was all feeling so close to perfect, but a few finishing touches remained. Our shipping container, green as it was, didn't quite share the same vibe as the rest of the site so Chris and friends set about cladding her with waney edge timber. At the same time, a shed was extended onto the end of the container to house our bins, recycling system, log store and rainwater capture. This was in some ways the heart of the set-up. People get to know each other so quickly next to a camp fire and a circular bench, all carved from the same tree, would be the perfect outside gathering point. Our friend Nick - who just happens to live on his own bus! - helped cut the pieces and we sat around the fire and enjoyed a celebratory beer. The YesBus, Yestival and YesTribe was so often about people that we forgot about the wonder of settling into the countryside. A blackbird Mumsy chose our new woodshed to give birth to her four chicks. They tweeted (they start so young, these days) their way through a fortnight in the nest and one by one they flew. Here are the last two, looking decidedly plumper than a week earlier! It's now nearing the end of May 2018 and we've held our first three events on board since officially opening. A social media and branding workshop, a team building session for Chichester College's management and our first school visit, complete with talks and playtime and BBQs an an overnight camp. The story has by no means ended, but this month has been a milestone. We can't wait for more people to come and visit the YesBus, the last two years have been leading up to this point, our doors are open and we hope to see you soon. We hope, as you finish reading this history of the YesBus so far, that you can now become a part of the story. We need your help, a little bit of love to send the bus on the next stage of its journey. Even without an HQ the YesTribe has made its mark on over 6500 people so far. Just imagine the impact we'll now have with the YesBus as an incredible countryside space for all kinds of events. So open up the driver's door, take a seat, and think of an event that you could host on the YesBus. We'll support anyone doing brave, new, impactful things in our world and we look forward to welcoming you to the bus very, very soon. Thanks to everyone who has supported this project so far, you've helped to create a space that will have untold impact on hundreds of people into the future.